More and more we are finding that today’s modern offices utilize an open concept design, where everyone sits in an open cubicle from the CEO on down. While this atmosphere encourages collaboration and a sense of community work, there is still a need for separate areas for private phone conversations and closed-door meetings. This creates demand for small meeting spaces and conference rooms. Have you ever been in the middle of an important meeting when you were interrupted by someone knocking on the door to say that she had reserved that conference room for her meeting? Or, have you ever brought a client to your conference room for a meeting, only to find that other members of your staff were sitting at the conference room table eating lunch? At some places of business, the conference rooms are in such high demand that, without having someone designated to keep track of conference room bookings, the rooms might actually end up being double-booked. There is a very simple, time-saving solution to avoid the interruptions and confusion. It’s called the Evoko Room Manager (ERM). 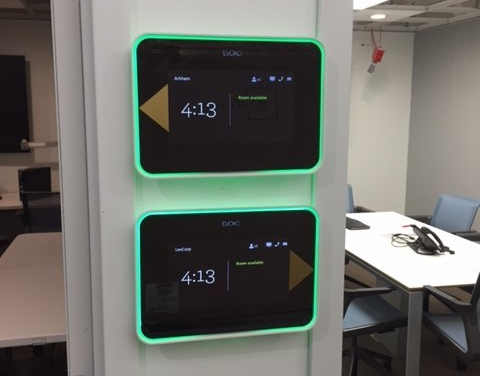 This sleek box with an 8 inch touch screen is mounted on the wall outside of the conference room, and it clearly indicates who has the room reserved, and at what time. It displays the current time, as well as the starting time and finishing time of a meeting in progress. The ERM is much more than a list of meetings on a schedule. The unit is integrated with Outlook, Exchange, Office 365, and Google Apps for Business, so when you schedule a meeting on your computer, tablet or smartphone, you also schedule your room. You’ll know immediately whether the room is available for your meeting. If a room is available at the time you want to meet, you can also book an impromptu meeting directly on the touch-screen of the ERM. If the room is booked at the time you want to meet, the ERM will show you the other rooms that are available. You can also touch the screen to extend your meeting past the scheduled time, or end the meeting early. In addition, the unit will send an email to the meeting organizer if he doesn’t confirm the meeting and, if it not confirmed within 5 minutes, will change the status of a room to “available,” enabling someone else to book the room. All of these changes are enabled right on the screen, without the need to involve another staff person for bookings. At any point in time, someone can see from a distance whether the room is currently in use. If the room is occupied, there will be a red glow around the unit. If the room is available, the glow will be green. There are additional benefits beyond scheduling. The Evoko touch screen can be used to report broken technical equipment in the conference room. An email is sent to inform your office/ facility manager, and the broken item – Computer, Projector, Whiteboard, Telephone, Lights, Other – is represented in red on the screen to inform everyone else who books the room. In addition, the admin panel can be used to get full insight into your company’s meeting patterns, including how many impromptu meetings are booked, how many meetings are extended, and how many meetings are booked without actually taking place. The scheduling and reporting features save your staff time and enable you to optimize your resources. This turnkey solution integrates seamlessly with your existing e-mail server and does not require any additional software or license. It takes just minutes to create the room accounts and configure the Control Panel. Interested in having Evoko Room Managers installed outside the conference rooms in your office? Big Idea is happy to offer Evoko Room Managers to both existing clients and other companies who recognize their value. Just call us! A note from Big Idea Technology: The Evoko Liso is Evoko’s newest room manager. It has all of the features of the Evoko Room Manager and more!